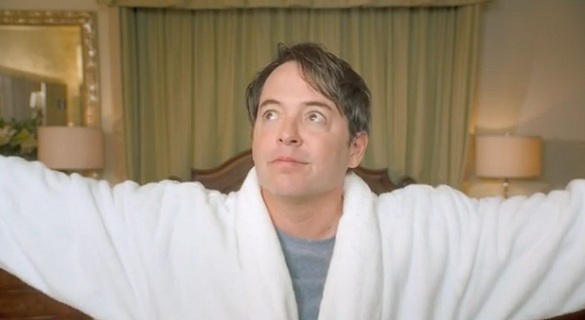 We've already told you about the upcoming Super Bowl ad featuring Matthew Broderick reprising his role as Ferris Bueller for a Honda CRV commercial directed by Todd Phillips (The Hangover), and now you can check out the entire thing online one week before it airs during the big game. At just about two-and-a-half-minutes, the Honda spot pays homage to a ton of scenes from the film, as it picks up with Broderick calling into work sick in order to take a day off and cruise around town in his CRV. From visiting a museum to attending a baseball game to singing in a parade, there are more than two dozen references to the original movie (according to Honda) spread throughout the commercial. Check out the ad below and let us know which Ferris Bueller's Day Off references you spot. On a separate note, Peter Berg (Friday Night Lights, Battleship) has stepped behind the camera to film a 30-second spot for Mini Cooper. Berg directed a Super Bowl commercial for Hulu three years ago starring Alec Baldwin. Berg will also direct a Super Bowl commercial for NBC's The Voice. While we'll have to wait and see how that turns out, check out the Mini ad below. UPDATE: Not to be outdone, Jerry Seinfeld flaunts his money in an attempt to score a brand new Acura with Jay Leno appearing at the end as the maniacal bad guy.